Are you ready to register or change your vehicle registration with the Nevada DMV and get your UNLV license plate for your car, truck, RV, motorcycle, or small trailer? Here are some tips to help register your vehicle and show your Rebel Pride every day! 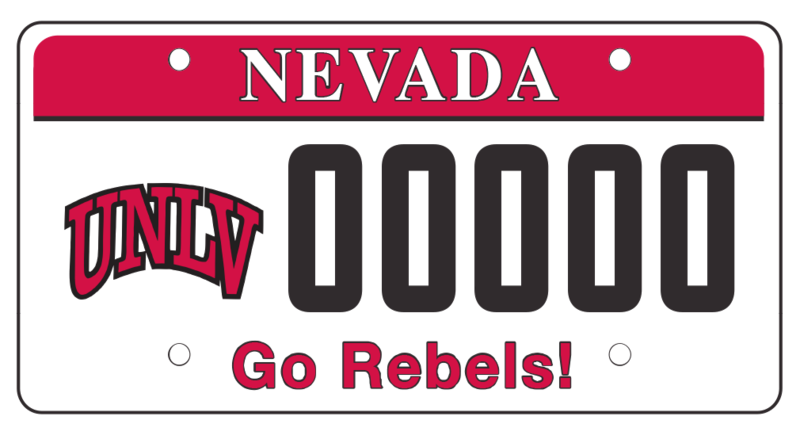 When buying a new or used vehicle, ask the dealer to register your vehicle with the UNLV 2018 plate. Many car dealers provide this option to you. If you are registering your vehicle on your own, review the Nevada DMV’s website for required documentation and ask for the UNLV 2018 plates when you register your vehicle. If your registration is up for renewal (expired or within 35 days of expiration), complete a smog check as required. To get the UNLV plate, you must visit a Nevada DMV office. At the office, remove your current plates and take with you along with proof of registration, smog check, and renewal notice. At the counter, ask to swap out your old plates with a UNLV 2018 plate and renew your registration. Visit the Nevada DMV with your completed Form SP 66 (enter style: UNLV 2018), required documentation for your new vehicle, and old plates off your vehicle (if replacing). The Nevada DMV will collect payment and issue a 60-day temporary movement permit for your vehicle. When your plates are ready, they will be shipped to your address. Allow 4-6 weeks for approval and production. Read the complete instructions on the Nevada DMV’s website to ensure success. Ship to your address – Visit the Nevada DMV with your completed Form SP 14 (enter style: UNLV 2018), proof of registration and old plates off your vehicle. The Nevada DMV will collect payment and issue a 60-day temporary movement permit for your vehicle. When your plates are ready, they will be shipped to your address. Ship to your Nevada DMV office – Simply mail or fax in your Form SP 14 (enter style: UNLV 2018) along with payment of $97. The Nevada DMV will send you a letter or postcard when your plates are ready for pick up. When you go to pick up your plates, take your proof of registration and old plates off your vehicle. The Nevada DMV will collect the transfer fee when you pick up your plates. Plates must be picked up within 60 days or they will be forfeited. Order your souvenir license plate for your home or office! A portion of your fee goes toward supporting the UNLV License Plate Scholarship Fund. Standard and miniature sizes are available. Visit the alumni site to order yours today!